With thousands of businesses running on Chargify, there are many things that developers and business owners would like us to add to make their lives easier. One of these things is Bulk Operations – the ability to change something on many subscriptions at the same time. In the day-to-day course of business, these kinds of things can save a lot of time for you and your coworkers. 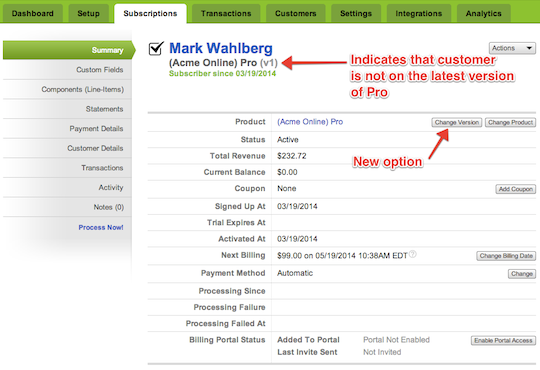 These functions allow you to select a subset of subscriptions and then change the billing date or product on all off them. 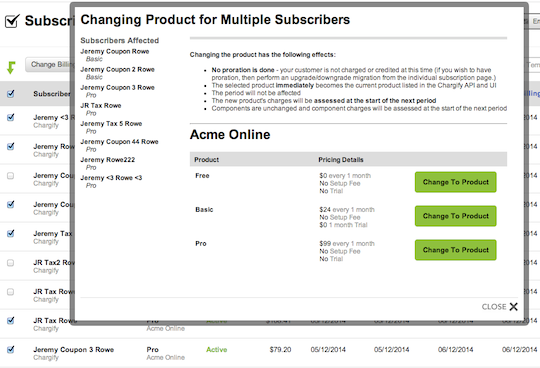 For instance, you can select the subscriptions where the billing period ends sometime next week AND they’re on the “Gold” product AND their status is “active”… AND then individually remove a couple of subscriptions because you know something about them specifically, and then apply a billing date change to all remaining subscriptions in the group. This is going to save a lot of time for Chargify merchants! It will really be useful for businesses that bill all customers on the same day of the month. Also very useful for business that ship real goods, where they need to adjust billing/shipping dates for whole groups of subscribers as they prepare shipments. Perhaps less common, but I’m sure very useful when you do need it, is the function in the image above: selecting a group of subscriptions and then moving them all from your “Silver” product to your “Gold” product. I know there are business reasons that give rise to this, and now it’s really easy to select 73 people on one product and move them all to another product. 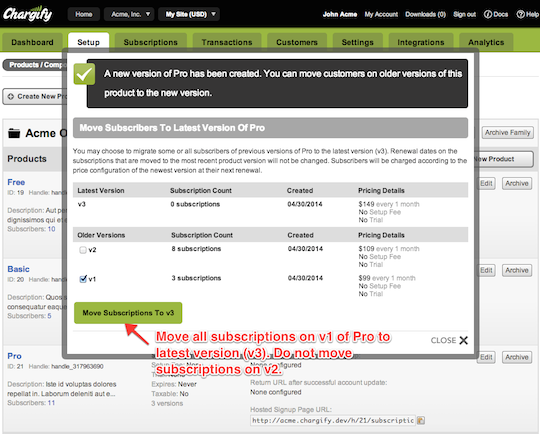 Sometimes, you need to change the product version of one or more subscriptions. Changes to a product do not affect older subscriptions already on the product, because we automatically create new product versions anytime you change something about a product. Over time, you can easily end up with 5 or 10 versions of the same product, and you may have customers subscribed to each version. This works well for most business needs, but there are times when you want old customers on newer product versions. For instance, maybe you just changed the price of your product and you want the existing 215 customers to pay the new price on their next bill. Until we released this new function, you had to change each one manually, OR you could write an API script to do it. We hope you’ll enjoy these new time-saving features!